1. Heat oven to 325°F. In 1-quart heavy saucepan, stir together butter, whipping cream and brown sugar. Cook over low heat, stirring occasionally, just until butter is melted. Pour into 2 (9- or 8-inch) round cake pans; sprinkle evenly with 3/4 cup pecans. 2. In large bowl, beat cake mix, pumpkin, water, oil, eggs and 1 teaspoon of the pumpkin pie spice with electric mixer on low speed until moistened. Beat 2 minutes on medium speed. Carefully spoon batter over pecan mixture in each pan. 3. Bake 43 to 45 minutes or until cake springs back when touched lightly in center. Cool 5 minutes; remove from pans to cooling rack. Cool completely, about 1 hour. 4. Stir remaining 1/2 teaspoon pumpkin pie spice into frosting. To assemble cake, place 1 layer, praline side up, on serving plate. Spread with half of the frosting. Top with second layer, praline side up; spread remaining frosting to edge of layer. Drizzle with caramel topping and additional pecans. Store loosely covered in refrigerator. Do you know I have JUST started using parchment paper for cookies, I did not know you can use it for cakes also. Why would you grease the pans first if your using parchment paper? Good thinking! I would have thought of that!!! This looks delicious. I may do this instead of pumpkin pie next week. Yum! Do you follow along on my blog? You are sure welcome to if you would like my friend. The more the merrier! Guess what? you won my giveaway! YAY!! Mmmmm... this cake looks amazing!!!! Happy FF. Sounds fabulous - easy and quick! I will be trying this recipe tomorrow...for the football crowd. Thanks for sharing it. That slice of cake looks so perfect it looks fake! It should be in Southern Living or something. I can't imagine how good this would be. I have seen so many great recipes on FF today that I have wanted to make for Sunday dinner with the family, but I think I have found the one. I could never blog my picture because it would never look this good. Thanks. 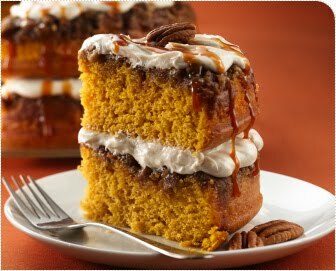 Such a yummy cake, I'm all for anything pumkin.